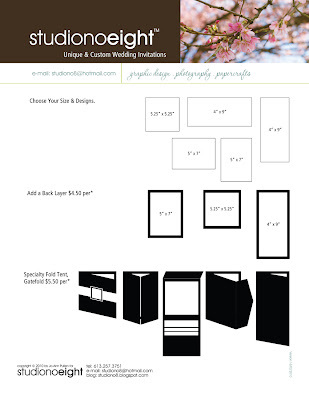 studiono8TM is a custom design studio that specializes in personalized one-of-a-kind wedding invitations. With 18 years experience in the graphic design industry I have found my love for creating hand made invitations for all occasions. We offer not only the standard options but we also offer other options such as ribbons, crystals, coloured card stock, or specialty papers. The possibilities are endless making your day both unique and one-of-a-kind. Our clients are extremely important to us and studiono8 was built on the concept of meeting our clients needs. We offer a personal service that offers our clients one-on-one consultations where they can express their ideas and design concepts. We also offer graphic design, web, Power Point and multi media services. To book a 1 hour FREE consultation call or e-mail us today. Nothing says wedding like creating a personal monogram that matches the wedding theme, and style. Choosing the right font is part of that. 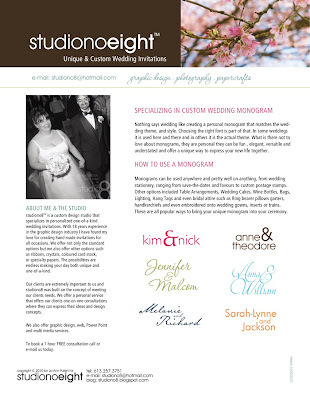 In some weddings monograms are used here and there and in others it is the actual theme. What is there not to love about a personal monograms, they are personal they can be fun, elegant, versatile and offer a unique way to express your new life together. Monograms can be used anywhere and pretty well on anything, from wedding stationery, ranging from save-the-dates and favours to custom postage stamps. Other options included Table Arrangements, Wedding Cakes, Wine Bottles, Bags, Lighting, Hang Tags and even bridal attire such as Ring bearer pillows garters, handkerchiefs and even embroidered onto wedding gowns, inserts or trains. These are all popular ways to bring your unique monogram into your ceremony. 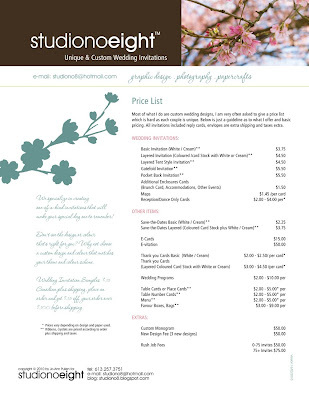 Most of what we do are custom wedding designs, we are very often asked to give a price list which is hard as each couple is unique. Below is just a guideline as to what we offer and basic pricing. All invitations included reply cards. Envelopes are extra prices do not include shipping or taxes. We specialize in creating one-of-a-kind invitations that will make your special day one to remember! Don’t see the design or colour that's right for you? Why not choose a custom design and colour that matches your theme and colour scheme. Wedding Invitation Samples $35 CND plus shipping, place an order and get $35 off your order over $300 before shipping and taxes.